In 2013, the Town of Golden (with the administrative support of the College of the Rockies) received a grant from the Seniors' Housing and Support Initiative (SHSI) to complete an Age Friendly Community Plan (AFCP). The SHSI program is intended to assist local government to support aging populations, develop and implement policies and plans and/or develop projects that enable seniors to age in place and facilitate the creation of age friendly communities. The Ministry of Health supported the initiative by providing funds to incorporate a focus on age friendly projects. The plan brought together many senior-focused groups and programs and was completed in July 2014. 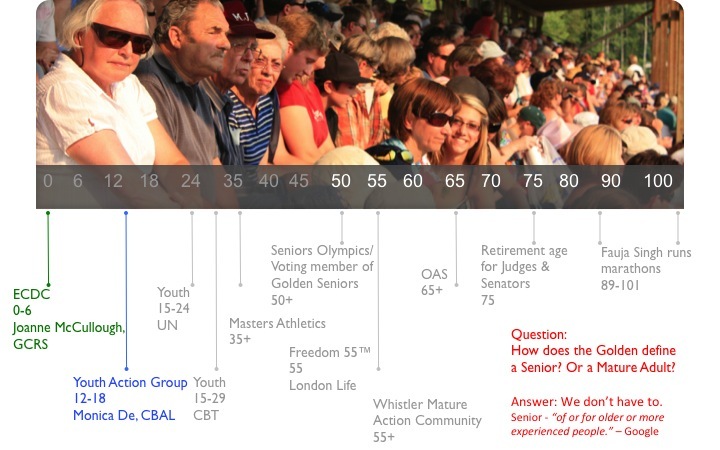 Age friendly communities are places where older people can live active, socially engaged lives through polices, services and structures designed to support them. After the plan was crafted and distributed, the Age Friendly Community Committee has continued to meet monthly, with Columbia Basin Alliance for Literacy (CBAL) holding space to discuss and move forward the priorities of the plan and other issues as they come up. This committee works very similar to the Early Childhood Development Coalition (ECDC), which is also hosted by Golden Community Resources Society (GCRS). If you have any questions about the Committee or the AFCP, please contact Ryan Watmough at nonprofits.gcrs@gmail.com or 250.344.8610. Minutes from each Coalition meeting can be found here. Please feel free to download and save them for reference. The following resources have newsletters that we encourage everyone to sign up for. We have been rotating our meeting spaces so that residents can experience all of our community spaces. Agenda items can be submitted to nonprofits.gcrs@gmail.com up to 48 hours before each meeting. Please send any suggestions for guest speakers to nonprofits.gcrs@gmail.com. Sidewalk condition and availability; and snow clearing are priorities from Golden's AFCP. Golden's Rotary Club and the Age Friendly Community Plan. Golden's AFCP Plan is Complete & Approved! 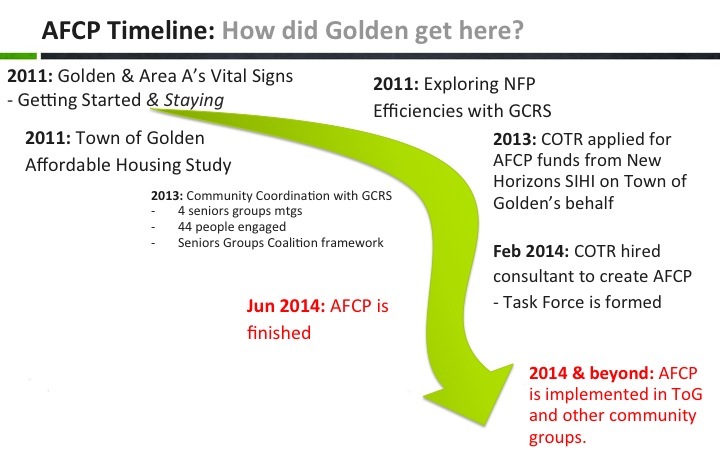 Countless hours from the AFCP Task Force and hundreds of surveys from local residents has resulted in Golden's first Age Friendly Community Plan. The Plan was submitted to Town Council on July 15th, 2014. Ryan Watmough made a delegation at a regular Council Meeting. In short, the presentation outlined the next steps towards Golden becoming officially recognized as an Age Friendly Community. Ryan Watmough was invited to make a brief presentation to the Rotary Club. The presentation focused on 3/8 relevant AFCP Dimensions: 1. 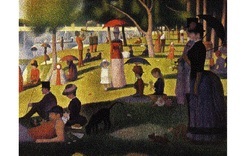 Outdoor spaces and public buildings, 2. Transportation and 5. Social Participation. Ryan Watmough made a brief presentation to the management staff at the Town of Golden. The AFCP Task Force was asked to attend a discussion about the Plan and possible tactics with the Town of Golden Council. At this rescheduled, 2-hour long meeting, the gap analysis was presented. Recommendations were then identified to address the gaps. These recommendations will then be weighted, in light of the survey respondents' priorities. The Task Force began to review the compiled data from the survey; breaking out into small groups to analyze the data in more detail and by each Dimension. The April 3rd meeting presentation can be found below. 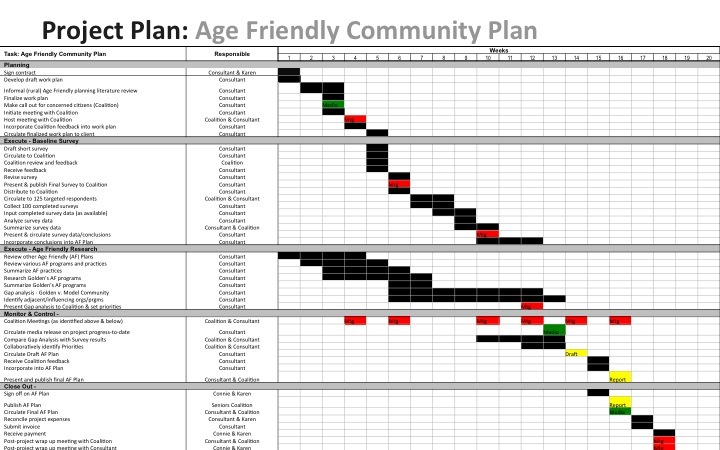 The March 27th meeting was 2.5 hours long and involved finalizing survey questions, delving deep into the 8 Dimensions of Age Friendly Community Planning. Files from the March 20th meeting presentation can be found below, along with new resource files from small and rural communities across Canada. Below, one can find the University of Waterloo's AFCP ﻿ Instrument Database﻿, which is invaluable when writing questions for a community's Needs Assessment. The following files include the presentation made at the March 6th meeting. 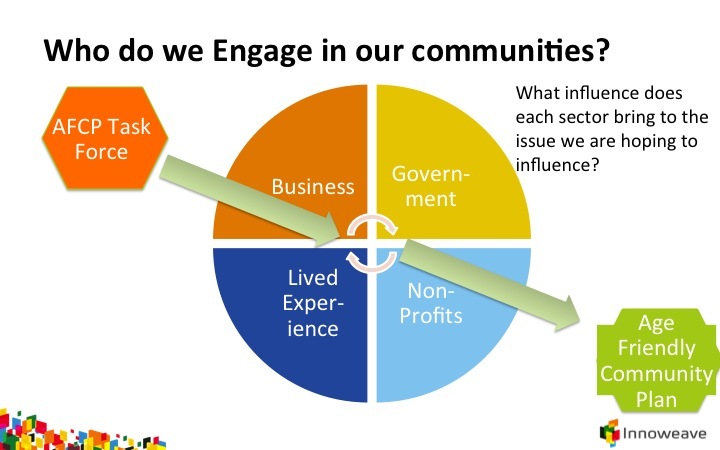 This presentation includes an overview of 2013 Community Coordination project "Seniors Groups" meetings. 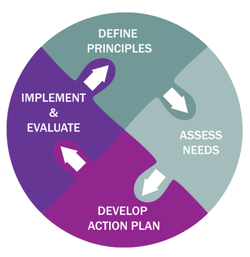 According to "Finding the Right Fit: Age-Friendly Community Planning", there are 4 steps involved in the creation of a solid AFCP.